I-70?) Want to fall in love with Columbus, see some fantastic landmarks or the best skyline view in town? Follow one of the below routes. Note: These routes are sometimes not efficient during the warm weather due to the many city runs and festivals. 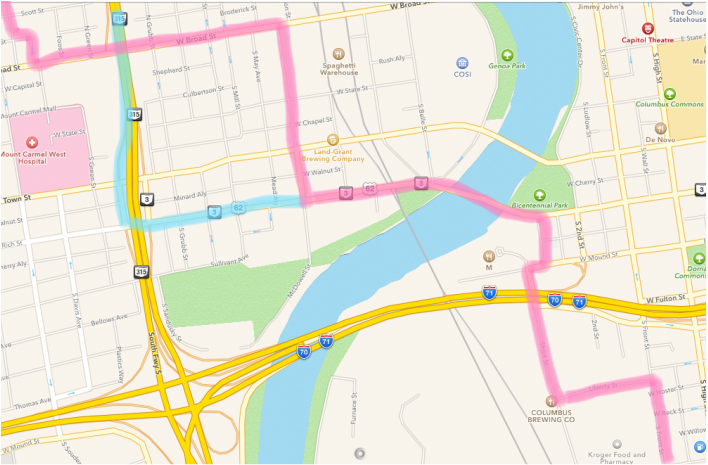 If you know downtown is hosting an event you may also try this* route. The Greenlawn Avenue exit from 71 South is not currently an option, and I understand will not be even when the construction is over. Pink Route One way to access 761 S Front Street from the Northwest part of town is to come through Franklinton. Take Dublin Road/33 to Sauder Avenue to Broad St. and before you go under the railroad bridge, turn right on McDowell St. (probably the most dynamic North/South street in the Franklinton Arts District). Cross State Street and Town and turn left on Rich continue East and follow detour via Town to Starling street and across the Scioto River on the Main Street Bridge. Once you’ve crossed the bridge turn right on Civic Center Drive between Miranova and Waterford Towers. When you dead-end onto Mound turn right and then immediately turn left onto Short St., going under the freeway. Drive a short way to Liberty and turn left and follow to Front Street. Turn right and we are a few blocks down on your right. ​(Blue Route--a little less of Franklinton..current favorite) Alternatively you can take 315 South to Rich Street and then follow the same directions as above. West half of Upper Arlington: Dublin Rd/33 becomes W Long as you come downtown. Take it to Marconi Blvd and turn right. It becomes Civic Center Drive. Follow along the river to where it dead ends at Mound Street. Turn right on Mound ​and then immediately turn left onto Short St., going under the freeway. Drive a short way to Liberty and turn left and follow to Front Street. Turn right and we are a few blocks down on your right. East half of Upper Arlington: Take Northwest Blvd south until it dead ends onto Goodale. Turn left toward downtown. Stay on Goodale until you come to Neil. Turn right at that traffic light, driving through the Arena District until you reach Spring (Westbound) and Long (Eastbound) there along the Scioto River. Turn left (East) onto Long street. Turn right at the next light at Marconi Blvd and follow the above directions. This route*, with a detour north (left) on Broad Street, (right) on Front, west (right) on Mound street, then the same as described above, has even worked when roads are closed for festivals.